This 2 bedroom apartment with swimming pool is located in Solliès-Toucas and sleeps 4 people. It has WiFi and air conditioning. The apartment is near a beach. Detached house, 4 people, 3 room/s, 2 bedroom/s, 1 bathroom/s, approximately 35 m², 1 floor/s, year of construction 2008. Feature: Property in a holiday complex (112 units in total). Equipment: internet access Wi-Fi for 1 device(s) (payment); combined heating/air conditioning. Electricity according to consumption approximately € 0.20/​kWh. Final cleaning by tenants or against payment, € 55(the kitchenette must be cleaned by tenants in any case). Holiday resort tax. Linen/towels must be brought along. Bed linen available on loan, € 8 per person/​week (on order). Towels available on loan, € 8 per person/​week (on order). Changing of beds, € 5 per person (on order). Deposit € 300 (Visacard, Mastercard, debit card). Cot/​High chair only within the maximum occupancy, each € 16 per stay (on order). Pet 1 pet allowed, € 35 per week (please advise prior to arrival; additional animals on request only). Internet € 22 per week per access. Situation: holiday village LE GALOUBET, residential area, hillside location, view of Sollies-Toucas; Vallee du Gapeau. Estate (shared use with holiday guests): approximately 6 ha, closed plot, in a hillside, trees. 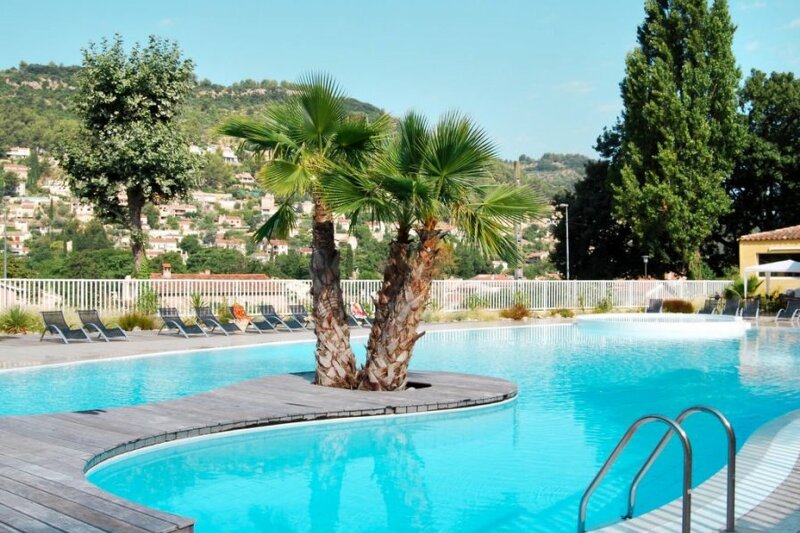 Pool (shared use): 250 m², 15/04/19-15/10/19, depending on the weather, heated 01/09/19-30/06/19, heatable, children's pool. Please note: distance to the pool approximately 100 - 400 m.
Wellness: shared use (payment): sauna, steam bath (no access for children, minimum age 18 years). Plot description: Access: access only for loading and unloading. Parking in the holiday complex approximately 200 m.
Access to the house via footpath approximately 200 m.
Terrace 17 m² (roofed), furnishing provided. The apartment is described as good value for money. It has a swimming pool and is located in Solliès-Toucas. It is set in a very convenient location, 18km away from a beach and only 800 metres away from the city center.